Earth anchor auger is designed to secure shelters, canopies, garages, trees,trellis etc into ground solidly. It’s made of heavy duty steel, and finished with powder coating or hot dip galvanized treatment. So earth anchor is featured at anti-corrosion and anti-rust. It’s easy to install: earth anchor could be installed manually through eye ring or by machine. 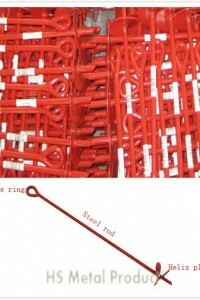 Earth anchor auger is made of steel rod,eyelet and helix plate. Helix is used to screw into ground and eyelet is used to tie off the objects. With similar features, we also produce ground screw post anchor. For difference usage, earth anchor auger has different sizes, hence the rod diameter, rod length, helix plate diameter, helix plate quantity can also change, we are factory ,so all size are avaialbe. Holding strength is according to soil condition, earth anchor length, helix quantity, and helix diameter.The bigger, the stronger. The length of rod ranges from 12″ to 48″ and helix diameter varies from 3/8″ to 5/8″. 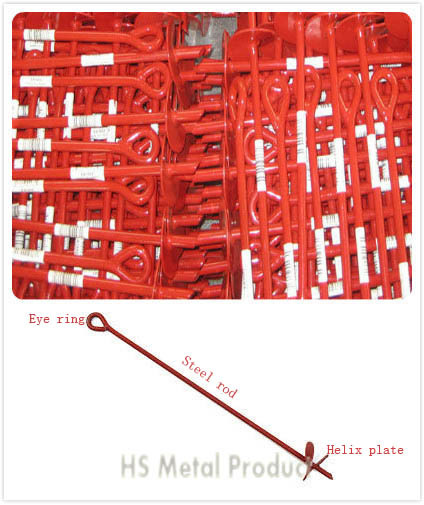 And as factory of helix earth anchor, we can produce according to drawings. Helix numbers can be added, like double helix earth anchor, triple helix earth auger anchor etc. Apart from earth anchor, we also manufacture ground screw foundation. Welcome importer,wholesaler,distributor to contact us. 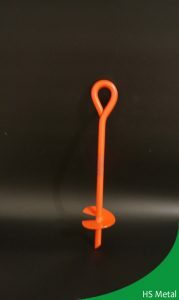 We supply earth anchor auger with competitive price and good quality.